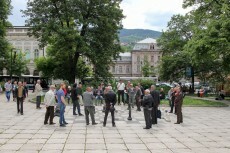 For foreigners this public sqare in Sarajevo is hard to pronounce. The full name is Trg Oslobodenja Alija Izetbegovic (named after the first President of the Republic of Bosnia and Herzegovina), in short Trg Oslobodenja or Liberation Square in English. The large square is situated along the busy pedestrian street, Ferhadija, and next to the largest Serbian Orthodox Cathedral in Sarajevo. It’s a nice place to chill either in the many cafés alongside Ferhadija or on the benches and walls facing the chess players. Because they are the real tourist attraction at this otherwise common square. 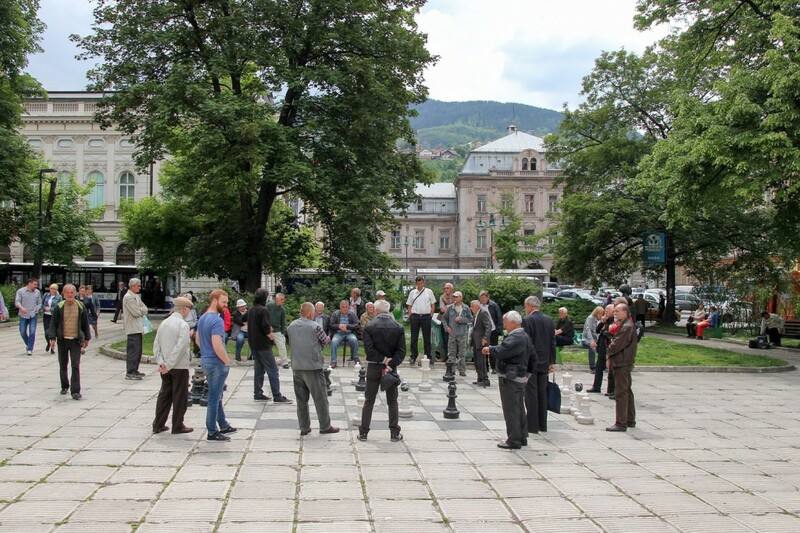 Every day mostly elderly men gather for some serious chess gaming. By now they are a popular photo motive, but don’t mind it as long as they don’t get interrupted at their game.